Taco Bell "beef" pseudo-Mexican delicacies are really made of a gross mixture called "Taco Meat Filling" as shown on their big container's labels, like the one pictured here. The list of ingredients is gruesome. Updated. That's the reason why an Alabama law firm is presenting a class action lawsuit for false advertising—they are not asking for any money—saying that the fake Mexican food maker should label their processed clustermass of disgust as what it really is in all promotional materials, following USDA laws. It appears that they have a very good point. Chopped fresh and/or frozen beef with or without seasoning and without the addition of beef fat as such, shall not contain more than 30 percent fat, and shall not contain added water, phosphates, binders, or extenders. That is certainly nothing like the mix that they are using in their products. The law firm argues that the meatmud correctly labeled as "taco meat filling" in the industrial packaging should be labeled in exactly the same way in all advertising and packaging, as the USDA mandates. Of course, the All-New Double Decker with Two Times More Taco Meat Filling would not sound very good on TV. Taco Bell's meat filling looks like ground beef before and after cooking, but it has been augmented with fibers and other substances to keep the price low. That's how they can offer tacos for 99 cents—and that's fine: There's absolutely nothing wrong with their processed mixture apart from being gross. The problem here is that the consumers may believe that this "meat filling" is actually beef while it's not. If it looks like beef, it's labeled as beef, and it's advertised as beef, then it must be beef—except that substance is not beef. It's just "meat filling". That could deceive the public, which is why there is a class action lawsuit in the works. Consumers have the right to easily learn what they are eating before making a decision to eat a taco or not, just like they need to know before buying cloned meat or genetically modified vegetables or products containing corn syrup. The final irony: The USDA says that any food labeled as "meat taco filling" should at least have 40% fresh meat. According to the Alabama law firm, Taco Bell stuff only has 36% meat. 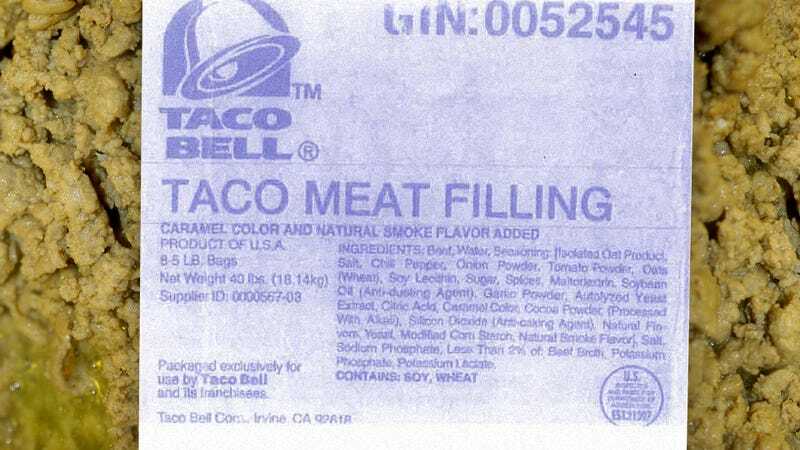 Perhaps they should call it Almost Taco Meat Filling. Update: The LA Times reports that the lawsuit doesn't ask for any money, just a correction. Taco Bell has issued an official statement replying to the lawsuit.